In days of increased concern about terrorism and fundamentalism, how inspiring it is to learn that Muslims are coming to Christ in increasing numbers in the Arab world. 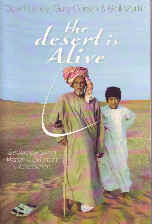 Through stories of Muslim background believers of the tentmakers who often introduced them to Christ, we learn about how spiritual life is forming in the deserts of the Arab world in the face of adversity. This book will give you new hope in the power of Christ to transform lives in the most unlikely places.